On March 22, 2018, Austin City Council passed Resolution No. 20180322-099 directing City staff to initiate a community engagment process and provide a detailed analysis of 10414 McKalla Place as a potential site for a proposed major league soccer stadium and return to Council with a detailed report no later than June 1, 2018. The Economic Development Department assembled an interdepartmental / interagency team to assist in the analysis as outlined in the resolution. Participating entities include: EDD, Financial Services, Office of Real Estate Services, Neighborhood Housing and Community Development, Planning and Zoning Department, Parks and Recreation Department, Austin Water Utility, Public Works, Austin Fire Department, Austin Police Department, Austin Transportation Department, Corridor Program Office, Watershed Protection, Public Information Office, and the Capital Metropolitan Transportation Authority. RESPONSE: Environmental Remediation: Anticipated: $0. In 2006, extensive remediation to the site occurred, resulting in environmental clearance to an industrial/commercial land use standard. In June 2017, the Texas Commission on Environmental Quality (TCEQ) issued a final closure letter for unrestricted/residential land use. Risk Level: Low. QUESTION: Please provide details about the 8 acres of “green space, open space and performance areas” accessible to the public. Will the green space and open space include walking/biking trails? Will it include other amenities, and if so, what? When will the space be available? Are the “performance spaces” described here outdoor spaces? Please confirm no charges would be assessed to the public for the use of these spaces. RESPONSE From PSV: The 8 acres of green space, open space and performance areas will include 3/4 of mile of trails and 1 ¾ miles of sidewalks. Other amenities could include food, beverage, and retail opportunities, but none of this is specifically known right now. The site will be accessible to the general public year-round during non-event times when the stadium project is completed, which is now expected to be April 2021. There is one area specifically designed performance space for concerts and other events, which could host events ranging from 30-3,000 attendees. There will also be open parking lots which could host music and cultural festivals. Green space and open space areas will be accessible at no charge during non-event times. Some outdoor shows in the performance area might be free to the public, while others could charge admission. QUESTION: Likewise, another bullet refers to a portion of the site being “accessible by the public for the enjoyment, health, comfort, welfare, and leisure activities, and special events.” [3/25] Is this space in addition to what is described in the bullet on page 2? If so, please characterize this space and describe how and when it will be accessible to the public. RESPONSE From PSV: This is the same 8 acres. We envision a variety of scheduled events, recreational activities, and spontaneous park usage during daylight hours. Please see the two attached pages for illustration. QUESTION: Does StadiumCo or another entity plan to program or to collaborate with another entity to program any of the open space for free public events? RESPONSE From PSV: That is quite possible, but those operational decisions are not yet known. PSV would attempt to maximize community enjoyment, economic impact and revenue generation. RESPONSE: This function is anticipated to be performed by existing permanent City of Austin staff as part of regular duties. QUESTION: Do the terms have StadiumCo paying for the costs of monitoring associated with the Better Builder program? RESPONSE: StadiumCo Lease and Development Agreement will have provisions for monthly reporting from StadiumCo regarding its progress with the Better Builder program, MWBE, etc. RESPONSE From PSV: Although operational specifics are not yet known, possible concepts could range from pre-scheduled stadium tours to free skills clinics hosted on the stadium pitch to complimentary tickets to matches to player visits. The opportunities are almost unlimited. QUESTION: Has StadiumCo approached Pickle Elementary and other nearby schools or the school district(s) to discuss planned or proposed collaborations? RESPONSE From PSV: PSV has reached out to local schools/districts to discuss potential collaborations for parking and shuttle service. PSV intends to reach out regarding additional collaborations once they develop their operational plan should the project be approved. Once the team is here it could include school visits by players and coaches, training, etc. RESPONSE: The stadium budget is $200 million, including a $10 million contingency. This provision is intended to not allow PSV to value engineer below $190 million. RESPONSE: The only increased costs the City would be liable for would be costs associated with discriminatory regulations targeted specifically at the stadium project or discretionary changes the City requests after the plan has been finalized. RESPONSE: Liability Exposures and Workers Compensation (slips/trips/3rd party bodily injury or property damage): The tenants shall maintain automobile and general liability insurance naming the City as additional insured for the lease of the city-owned facility and all of their events. The City requires tenants to maintain workers’ compensation coverage. If the City is using the facility for a civic event and COA employees are working on-site the City will be liable for workers’ compensation costs for injury to City employees. The City is self-insured for liability and workers’ compensation. Property Insurance: The City purchases property insurance for all owned and leased facilities. The City would add this location to our existing property insurance policy upon City ownership of the facility. The estimated cost of the property insurance is estimated to be $3,091,440 over the next 20 years. RESPONSE: The City would only be responsible for game day off-site costs. The estimated cost is $150,000 annually. RESPONSE: The rent amount contained in the term sheet was negotiated to take into account revenue sharing, capital reserve fund contributions, and adequate revenue to cover the limited City financial responsibilities. The deal is net positive to the City by $20 million over the first 20 year term. Attached is a revenue sharing example by the Austin Parks and Recreation Department. RESPONSE: This item in the term sheet references directional signage which is standard road signage to direct patrons to the stadium and parking areas. Many jurisdictions, such as the City of Austin have in-house capability to produce these signs. It is standard practice to provide such signs for high visit attractions. The directional signage costs and the payment of such costs will be addressed in the directional signage plan. Annual costs for TxDOT signs are low, at less than $2,000 per sign. QUESTION: Please explain rationale for having the city assume a higher payment to the Capital Repairs Reserve Fund in years 6 and 7. RESPONSE: The rent payment was negotiated specifically to ensure funds would be made available for a Capital Repairs Reserve Fund. The city contribution from rent leverages additional funds from PSV. The city’s share of the Capital Repairs Reserve Fund comes from rent payments (no net new cost to city). Since no rent is paid in years 1-5, years 6 & 7 are catch-up payments. RESPONSE: The parties intend to enter into discussions on the training complex prior to the execution of the stadium agreements. If the training complex involves additional city land, a separate agreement would be brought forward for Council approval. RESPONSE: The term sheet has been updated to incorporate the community benefits requirement into the Stadium Lease and Development Agreement. RESPONSE: Yes. The list of pre-approved architects and contractors was provided by PSV. QUESTION: What will the ticket price range be, and will StadiumCo offer discount tickets to youth soccer players and students from area colleges and universities? RESPONSE From PSV: Pricing will be determined, but will be comparable to other MLS clubs and will include a broad range of prices to meet the demand of fans. There will be group ticket promotions for many area groups – high school, college, soccer clubs, etc. QUESTION: Please indicate how many accessible parking spaces will be available. RESPONSE: International Building Code requires 20 accessible parking spaces per 1000 parking spaces. QUESTION: Please describe where employees will park. RESPONSE From PSV: The employee parking plan for temporary staff on match days will be developed and will likely include a combination of on-site and off-site parking and shuttle service. QUESTION: Please identify the expected pedestrian routes to and from the stadium and describe the plan for minimizing potential conflict between vehicular and pedestrian traffic upon entrance/exit from the stadium. RESPONSE From PSV: PSV will work cooperatively with the City and other agencies to develop a Transportation and Parking Plan that will address vehicular, pedestrian, bicycle, etc. routes and coordination. QUESTION: How many non-soccer events does Stadium Co. intend to hold on an annual basis? Will that expected figure be codified or capped in the stadium agreement? RESPONSE From PSV: The site will be utilized throughout the year for a variety of ticketed and non-ticketed events. Various areas will be utilized more than others. Green space, open space and performance areas will be open to the general public during non-event days throughout the year. The stadium lounges and meeting spaces will be utilized for meetings, banquets, weddings, conferences, etc. The stadium bowl will be utilized for soccer matches, other sporting events (including professional, collegiate, high school, amateur, etc. ), concerts, cultural, community oriented events, etc. In order to make the project feasible and to maximize the economic and fiscal impacts of the project, the stadium agreement will provide maximum flexibility to host events on the site, without a cap. QUESTION: #2 Charitable Contributions: How will the organizations be identified who would benefit from this contribution of $100,000 and who would identify them? RESPONSE From PSV: The club and its charitable foundation will set up a mission and guidelines for charitable giving. All decisions will fall within that mission. The foundation and the club’s community relations department will establish much of this when MLS comes to Austin. It is believed that soccer-related and health and wellness causes could be supported. QUESTION: #5 Youth Soccer Clinics: How many young people can participate in each soccer clinic? How will participants be selected? Where will the clinics be held? What ages are targeted for these clinics? RESPONSE From PSV: All of this will be established once the team is operating in Austin. All clinics will be run by soccer experts – trained coaches and players. The club is likely to cooperate with local youth clubs and rec departments to determine many of these factors. These programs will be available for girls and boys and all neighborhoods of Austin. QUESTION: #6 Youth Soccer Camps: How many young people can participate in each soccer camp? How will participants be selected? Where will the camps be held? What ages are targeted for these clinics? RESPONSE From PSV: All of this will be established once the team is operating in Austin. All camps will be run by soccer experts – trained coaches and players. The club is likely to cooperate with local youth clubs and rec departments to determine many of these factors. These programs will be available for girls and boys and all neighborhoods of Austin. QUESTION: #7 Youth Club Scholarships: What criteria will be used to identify young people for these scholarships? RESPONSE From PSV: It is believed that interest in soccer and financial need will be two key criteria. QUESTION: #11 Soccer Field and Futsal Court Construction: Who will make decisions about where investments will be made into new or upgraded soccer fields? What criteria will be used to make these decisions? RESPONE From PSV: All of this will be established once the team is operating in Austin. The club is likely to cooperate with local youth clubs and rec departments to determine where it would be best to build or refurbish these fields and futsal courts. This infrastructure is intended to make them most widely available for girls and boys and all neighborhoods of Austin. QUESTION: Is the Special Events Trust Fund a potential source of funding for the development of a proposed Major League Soccer Stadium on the McKalla Place City-owned land? RESPONSE: The State of Texas Events Trust Fund is not an eligible source of funds for the construction of a Major League Sports stadium or a source of funding for ongoing operations. The requirement that the event cannot be held more than one time per year disqualifies the use of funds for a pro soccer franchise, given that Precourt Sports Ventures has specified that an MLS team will be hosting approximately 17 games at the stadium each year. Major league soccer game regular season games are also not specifically named as events in statute Article 5190.14, Section 5A. Therefore, this activity is not eligible for funding for the Major Events Reimbursement Program. The State of Texas Events Trust Fund may be available on a limited basis for one-time, unique high economic impact events. QUESTION: If for some reason the City or StadiumCo terminated the lease, what would the City do with a soccer stadium to generate revenue? RESPONSE: In the case of a terminated lease, the City could: seek an alternative tenant (other team / league); lease it to another provider of outdoor entertainment (such as music production company); sell the stadium to another entity (such as a school district or university), or demolish the stadium for redevelopment. QUESTION: What is the minimum parking requirement for the stadium? RESPONSE: A stadium is classified as an outdoor entertainment use in the land development code. The minimum parking requirement for Outdoor Entertainment is Schedule B (Director Determination). [Austin Land Development Code 25-6 Appendix A – Tables of Off-Street Parking and Loading Requirements] The Transportation and Parking Plan required in the term sheet would provide the Director the information needed to make the determination. QUESTION: Please provide a summary of all city costs and revenues contained in the term sheet. RESPONSE: See attached Capital Costs and Estimated Annual Revenue and Expenditures. QUESTION: Page 10 of the term sheet indicates "The Club will guarantee all obligations of StadiumCo to the City." Has city staff reviewed the financial wherewithal of the Club to make sure it can actually perform on the guarantee? If yes, please describe the financial standards used to make that determination. If not, please describe how the City expects the guarantee to be meaningful. These are important safeguards because StadiumCo is a single asset entity with no other revenue or assets except for the stadium which will have a lien on it. The Club needs to have substantial net worth and cash flow besides this stadium. RESPONSE: With the assistance of the City’s consultants and outside counsel with expertise in this area, City staff has conducted due diligence on Precourt Sports Ventures (PSV) and is satisfied with its financial ability to perform on the guarantee. The City is aware that the obligations of StadiumCo need to be safeguarded and has accounted for that. All MLS-related revenue will flow through StadiumCo as direct party and the Club as guarantor. StadiumCo will have additional revenue streams via non-MLS events at the stadium, and the Club has substantial value by virtue of its MLS operating rights. QUESTION: P. 7 states “PSV projected sources and uses for financing proceeds will be reviewed with, and be subject to comment and reasonable approval by the City and its advisors for the sole purpose of confirming PSV’s ability to finance the Stadium Project.” Given that language, what protections will there be in the financing for the City to make sure Austin is protected first, before the lenders? For instance, how do we make sure our lease is not subordinate to their loan, that we get notice of defaults etc. What rights will we have as a creditor if PSV files for bankruptcy? - and following the term sheet when would those rights be clarified? RESPONSE: The City is the lessor and is not acting as a creditor, nor is the City acting as any type of financial backstop on PSV’s obligations. The Term Sheet contemplates adequate guarantees and protections that will be further delineated in the Stadium Lease and Development Agreement. The lenders and the City will enter into a customary non-disturbance and attornment agreement to ensure the continued operation of the Stadium following an event of default under the StadiumCo financing. The City will not be required to subordinate its fee interest in the property to the leasehold mortgage of the lenders. The fee interest of the City will remain unaffected. The non-disturbance and attornment agreement will also provide that the lenders will give notices to the City of a default under the StadiumCo financing. In the unlikely event of a StadiumCo bankruptcy, the City would be entitled to pursue all amounts owing to the City under the Stadium Lease and Development Agreement. QUESTION: What happens if PSV does not secure financing, permitting, construction in a timely way, or never does anything period? Can we get the land back in the first 5 years? Can PSV sit there for 5 years paying no rent and doing nothing? Is there a deadline by when PSV needs to secure their financing or Austin can walk away? Or do we have to sit there for 5 years with no rent income? RESPONSE: PSV has an interest in developing the new stadium as soon as possible. However, if PSV does not obtain financing for the Stadium Project by a date to be specified in the agreement, the City may terminate the agreement. In addition, if PSV does not enter into a construction contract by a date to be specified in the agreement, the City may terminate the agreement. QUESTION: Page 4 of the term sheet states: “The City will assist and cooperate with PSV and StadiumCo through the City’s execution of consents, subordination and non-disturbance agreements, estoppels and such other assurances as may be reasonably requested by PSV’s lenders from time to time.” Please describe the scenarios envisioned where the city would consider subordination as described at the top of page 4. In addition, please explain if the term "subordination" on page 4 would allow the city to subordinate its land lease. I am concerned that if PSV defaults on its loan the bank could wipe out the lease and Austin would have nothing. Finally, why would Austin ever subordinate its land lease? RESPONSE: As landlord, it may be necessary for the City to reasonably assist PSV and StadiumCo in these customary respects. The City will not, however, subordinate its interest in the Rent, Stadium Lease and Development Agreement and the Site. These provisions typically run to the benefit of the lenders as against the tenant, not against the landlord. The non-disturbance agreement would have the lenders and the City confirm that it will maintain the lease in effect following a foreclosure or similar event and grant the lender a cure period to rectify any defaults of StadiumCo under the lease. As long as the City is not in default of its obligations under the lease, the lease will survive any foreclosure action and be kept in place. The land will remain owned by the City under all scenarios. QUESTION: With reference to terms on page 5, how does the city enforce the obligation to tear down a half built stadium if PSV or the Club is broke? More broadly, how are all of PSV’s obligations enforced if their only asset is this stadium and team? RESPONSE: Protections for the lender and City will be included in the financing documents to prevent this from occurring. QUESTION: Who can get revenues from ancillary developments is confusing - page 11 attributes the revenue solely to StadiumCo, but on pages 2 and 3 city approval or rights to ancillary development may contradict that notion. Please explain how we should think about the ancillary developments in terms of taxation, approval rights, and revenue. RESPONSE: PSV's financial commitment to fund construction of the stadium, site preparation, open spaces, parking, transit improvements, combined with the rent and other financial commitments and risk has been made with the understanding that PSV would retain the right to develop a portion of the balance of the property and retain such revenues. PSV would pay property, sales and other taxes on the ancillary development. The City retains approval rights and land use, zoning, and all other regulatory approvals for the ancillary development. QUESTION: The parking clause related to the city taking over ancillary development seems like it would preclude much future ancillary development by the city. Would this clause allow them to park cars on dirt and then say we have to replace that parking? RESPONSE: The Stadium Lease and Development Agreement and approved site development permit will determine which, if any, parking replacement will be required. The project does not contemplate dirt parking onsite. QUESTION: Under what conditions would the ancillary development made possible by the term sheet come before Council for approval? RESPONSE: Ancillary development would be subject to normal regulatory approval processes required under the Land Development Code. If Council approval is part of that normal process, it will come before Council. QUESTION: Can ancillary development be built and taxable without subdividing the land? Either way, how come future ancillary development building off the lease agreement does not require an RFP? RESPONSE: It is not anticipated that subdivision would be required in order to build the ancillary development. TCAD can establish separate tax parcels that do not correspond to property lines. An RFP requirement is not triggered by what is proposed to be done on leased City land but rather by the length of the proposed lease term. Because City land may be sold only through a competitive process, if a lease term is effectively a sale (such as a 99-year lease), then a competitive process would be required. A lease term of 20 to 50 years is not effectively a sale and is truly a lease. An RFP is not required for a lease. QUESTION: As structured, it seems like PSV has a 5-year option for no option fee on a $20 million asset. Is there a list of steps that PSV needs to take by certain dates? In other words, is there a part of the terms or agreement that requires PSV to accomplish certain aspects by certain dates where failure to meet those dates is a default and Austin can terminate or such that there are real penalties for PSV for not reaching milestones? RESPONSE: PSV does not have a 5-year option. If PSV fails to provide reasonable evidence to the City of a financing plan to fund the Budgeted Costs in accordance with the procedures and benchmarks to be mutually agreed upon by the parties in the Stadium Lease and Development Agreement, the City may terminate the agreement without any further financial obligation and be reimbursed for certain fees and costs incurred by the City. In addition, the agreement will include covenants on construction schedule, completion date, and consequences of a delayed opening. QUESTION: Does anything in this agreement indicate the MLS team has to be the Columbus Crew? Were MLS to grant the rights would the agreement allow them to start a team from scratch? RESPONSE: PSV controls the operating rights to Columbus Crew SC and is the only entity that has rights to the Austin market for MLS. QUESTION: Why was the last clause of the Real Estate section related to public access deleted in the updated term sheet? What kind of rights of public access exist? QUESTION: The “additional considerations” section lays out minimizing the impact on neighboring communities during construction. How are the neighboring communities protected during the use of the stadium i.e. in the post construction period? RESPONSE: The Club will with work with the Austin Center for Events (ACE) for the process to establish the event impact area around the Stadium for home games and other large events. This existing ACE process includes working with AFD, APD and Transportation to determine emergency access for fire and police, no parking areas (if and as needed), lane closures or controlled access (if and as needed) and amplified sound permits. The ACE process also includes working with area stakeholders, including all neighborhood associations in proximity to the park as well as businesses and residential buildings (condos/apartments). During this process, all parties will work together to make sure that the impact to surrounding residents and businesses is minimized. This includes but is not limited to: no parking signage in neighborhoods and strict enforcement by APD, which also ensures that emergency vehicles can access any resident and managed lanes. QUESTION: Does the City have the right to terminate the lease after 20 years? What happens to the stadium if PSV does not renew at 20 years? RESPONSE: No. PSV has the right to renew for three additional 10-year terms. At the end of the initial lease term, PSV could choose not to exercise its renewal option, and the agreement would expire. In that case, the City retains ownership and could: seek an alternative tenant (other team / league); lease it to another provider of outdoor entertainment (such as music production company); sell the stadium to another entity (such as a school district or university), or demolish the stadium for redevelopment. QUESTION: Can PSV spend the Capital Reserve Fund before the 20 years are up? RESPONSE: PSV is responsible for all capital repairs, replacements, and improvements to the Stadium for the benefit of the City regardless of the level of the Capital Reserve Fund. In the event the Capital Reserve Fund does not have funds, PSV would still have to make the repairs, replacements, and improvements. The purpose of the Capital Reserve Fund is to provide an extra level of certainty that repair and replacement of stadium components will be made according to the Capital Repairs Standard. It is possible that the last of the Capital Repairs Reserve Fund could be used in the final year of the initial term. This would mean that needed repairs are being carried out according to the Capital Repairs Standard. QUESTION: What are the projected direct costs for the city over the first 25 years? At a minimum this calculation should include estimated costs for clean-up, off-site infrastructure, off-site service provision during matches, capital reserve fund contributions, insurance costs, the potential movement of the CapMetro station, and legal representation (in the lead up to the deal and then estimated for advocating for Precourt Sports Ventures (PSV’s) tax abatements). RESPONSE: The City has no anticipated direct out-of-pocket expense for the project. The negotiated rent payment takes into account any City responsibilities and risks associated with development and operation of the stadium, as outlined in the term sheet. -Environmental Remediation: Anticipated: $0. In 2006, extensive remediation to the site occurred, resulting in environmental clearance to an industrial/commercial land use standard. In June 2017, the Texas Commission on Environmental Quality (TCEQ) issued a final closure letter for unrestricted/residential land use. -StadiumCo is responsible for any necessary infrastructure (i.e. utility connections, upgrades) required to build the stadium. - PSV is responsible for on-site (on the 24 acres) costs related to stadium events associated with typical municipal services; they are also responsible for these costs off site for non MLS/professional soccer games. Per the negotiated term sheet, the City shall be responsible for any offsite (off the 24 acres) Municipal Services. Staff anticipates these costs to be associated mostly with pedestrian and traffic control, and will be determined in more detail during the Traffic Impact Analysis and through the development of the Transportation and Parking Plan. -Capital Reserve Fund. Per the term sheet, StadiumCo will be responsible for all costs associated with the Stadium Project, including maintenance. Of the $8.25 million in rent received from the team, the City will contribute $2.375 million from rent payments to the Capital Reserve Fund over the first 20 year term of the lease. The team will contribute $1.875 million. -The stadium will be a City of Austin asset. Insurance is estimated to be $3M over the 20 year term. The City would follow standard procedure which is to purchase property insurance for all owned and leased facilities. The tenant will cover all operating related insurance. -Council authorized negotiation and execution of a contract with Greenberg Traurig, LLP for legal services related to the development of a soccer stadium on City-owned land located at 10414 McKalla Place in an amount not to exceed $200,000. 20180628-117. QUESTION: What is the calculated city subsidy which consists of the market lease value ($1.9 million per year plus an assumption on the annual increase in rents) as well as the tax revenues (city and all other entities) foregone for a $200 million stadium over a 25 year period? RESPONSE: The Fair Market Value Appraisal lease is based on a dense, mixed-use development, not a publicly owned soccer stadium and park. All publicly-owned major league sports facilities in Texas are exempt from property tax. The site is currently tax exempt, therefore, there is no subsidy. QUESTION: In two recent contracts we recently agreed to lease property for various city departments. One of these was for our Municipal Court and the other collectively for multiple departments (including Code). For each case, please provide details on how much we are paying annually for each lease, how much square footage we are getting, how many parking spaces come with each lease and how much acreage our lease covers. RESPONSE: See attached PDF. Please note that site acreage is not available for office leases. QUESTION: Please explain what mechanisms the city has to hold PSV accountable for providing the community benefits listed in Exhibit 4. In addition, what legal import do the exhibits shown within the term sheet have? What obligations would PSV have to deliver on those benefits in similar or greater magnitude? In addition, what annual reporting requirements are mandated? RESPONSE: The community benefits will become a condition of the lease. Failure to perform on lease terms will be grounds for termination of the lease, subject to notice to cure. It is anticipated the lease will require annual reporting subject to audit. QUESTION: In the highlighted community benefits in Exhibit 4, $1.5 million annually is accounted for by PSV’s farm team training program, focused on Austin area youth. Please clarify how many different youth are expected to participate during the first 25 years. PSV’s team is a professional male soccer team - is this training program limited to and/or primarily focused on young men? Will young women be able to participate at equal levels? Does MLS require each team to set up this kind of training academy? RESPONSE: This information has been provided to PSV. QUESTION: Please explain how many stadium centered events are allowed a year. The terms mention 20 matches and 5 city/public events. Are other large scale events allowed? Please provide any other additional information that would help us understand whether the full stadium events are limited to 25 or if PSV (or the city) can rent out the stadium for other events beyond the 25. If additional events are possible, please clarify who bears the costs of such events. RESPONSE: PSV/StadiumCo has the right to produce as many events as they wish. They anticipate a similar number of non-soccer events as soccer events (17). QUESTION: There is some discussion of conference rooms and other facilities within the stadium that may be rented, but no detail on how often they may be rented or the size of these facilities. Please provide details on other types of events and their sizes. QUESTION: Please provide an estimate of the off-site costs to be born by the city for the 20 matches. Please also specify how much we will have to spend for a single match for these off-site costs. RESPONSE: The team is responsible for on-site (on the 24 acres) costs related to stadium events associated with typical municipal services; they are also responsible for these costs off site for non MLS/professional soccer games. Per the negotiated term sheet, the City shall be responsible for any offsite (off the 24 acres) Municipal Services. The City anticipates these costs to be associated mostly with pedestrian and traffic control, and will be determined in more detail during the Traffic Impact Analysis and through the development of the Transportation and Parking Plan. QUESTION: Please explain how the term sheet addresses concerns for parking in the area. RESPONSE: The parties shall work together to develop a Transportation and Parking Plan (including a traffic impact analysis), for which the City agrees to assist in the coordination of all relevant City, Capital Metro, Travis County and State agencies and stakeholder groups. The plan will be based on the transportation plan developed for PSV’s proposal dated June 1, 2018. Resulting from discussions with Capital Metro, the term sheet includes a provision that the site will be transit ready. Parties will work together to explore 3rd party and other financial sources for the construction of a new metro rail station adjacent to site. QUESTION: If there are only 1000 parking spots and if parking is spread throughout neighboring areas who is responsible for directing traffic, PSV or the city? RESPONSE: StadiumCo is responsible for all costs related to municipal services in the Stadium and on the Site in all cases. They are also responsible for those costs off-Site in relation to non-soccer-game events. The City, therefore, is responsible only for off-Site municipal services related to professional soccer games. The estimated cost is $150,000 annually. QUESTION: What does it mean to say “reasonably approved by the city” when discussing ancillary development on the site? RESPONSE: Standard legal term meaning any ancillary development will need to meet current regulations and be deemed compatible with other development on site. In addition, the City would follow practices established in previous redevelopment of multi-use developments. QUESTION: Please specify what off-site infrastructure the city would be obligated to provide and fund, including estimated costs. RESPONSE: StadiumCo is responsible for any necessary infrastructure (i.e. utility connections, upgrades) required to build the stadium. QUESTION: When could we reasonably expect a ruling by TCAD or another governmental entity on the tax status of the arrangement? If that process takes time and the ultimate ruling is that the stadium is not exempt, according to the terms will the city be reimbursed for any costs incurred in the interim? RESPONSE: All publicly-owned major league sports facilities in Texas are exempt from property tax. If TCAD determines that the structure of this deal is not tax exempt, PSV/StadiumCo is responsible for tax payments. QUESTION: Please explain what it means for StadiumCo to not pay sales and use taxes on construction that falls under the category of tangible personal property. How much revenue are the city and other entities foregoing from that? RESPONSE: Under State Law, construction materials used for Public Works Projects are sales tax exempt. Assuming $150 million hard costs for the stadium, the sales tax exemption is worth $12,375,000. QUESTION: Please provide details on what StadiumCo would have to pay in taxes to all relevant local tax levying governmental units on a $200 million stadium in the absence of a tax exemption. QUESTION: What physically falls under the “stadium” in terms of the site? For instance, is the park to be developed by PSV or by the city? RESPONSE: The entire site is to be developed and operated by PSV/StadiumCo at their expense. QUESTION: How much total is the city expected to contribute to the capital reserve fund over 25 years? How much is PSV/StadiumCo expected to contribute to the capital reserve fund over 25 years? RESPONSE: Per the term sheet, StadiumCo will be responsible for all costs associated with the Stadium Project, including maintenance. Of the $8.25 million in rent received from the team, the City will contribute $2.375 m from rent payments to the Capital Reserve Fund over the first 20 year term of the lease. The team will contribute $1.875 m. The stadium will be a City of Austin asset. QUESTION: Please explain the respective roles of the term sheet and the stadium agreements in this process. In addition, please clarify whether the council will have an opportunity to approve the stadium agreements. The term sheet indicates MLS has the right to review the stadium agreement but appears silent on the council role. RESPONSE: Council Item 20180809-19 is posted for: Authorize negotiation and execution of agreements with Precourt Sports Ventures, LLC, or its affiliates, related to the construction, lease, and occupancy of a sports stadium and associated infrastructure and development on a city-owned site located at 10414 McKalla Place, under terms outlined in a term sheet. QUESTION: The term sheet seems silent on the number, type, and salary levels of jobs to be created. Why is that? All of our other incentive programs seem predicated on jobs delivered. What number, type, and salary level of job do we expect to be created and/or is PSV/StadiumCo obligated to deliver? RESPONSE: The McKalla Place Stadium project (20180809-19) is not an incentive program. Please see PSV’s June 1, 2018 proposal for estimated employment impacts. QUESTION: Please explain whether and to what extent PSV is obligated to located its practice fields or its offices in Austin. Also, please explain what commitments the city is being asked to make with respect to the practice fields. RESPONSE: PSV is exploring options for practice facilities and headquarters, but is currently focused on the McKalla Place Stadium agreement. The preference is to have the practice facilities and headquarters co-located within City of Austin limits, but may be located in the Austin Metro area outside of city limits if a suitable location cannot be found in City limits. The B&D VENUES’ representative advised, in response to my [Council Member Leslie Pool] concerns that the group primarily worked in support of building stadiums, that they actually mostly (often) advised against doing a municipally funded project. Or words to that effect (for reference, the exchange I'm referencing is from the work session on June 12). Which of the clients on the list provided are ones that wanted to do a stadium but B&D Venues advised or argued against? If they are on a separate list, then please provide that list. The rep, in his answer, seemed to indicate that rather more (a sizable number?) of their clients decided against building a stadium than actually went through with it. Please have B&D Venues provide details to back up that statement. B&D Venues has completed assignments on approximately 140 sports venue projects over the last 25 years, 85 of which were professional sports stadiums, arenas or ballparks in a municipal setting (as opposed to, for example, a collegiate venue). Each of these projects represented a unique set of conditions, with regard to the strategies and goals of the local governments involved, the facility needs and financial capacities of the sports teams involved, and the economic conditions of the time. B&D Venues views its role in any of these assignments NOT as being to “argue against” or “argue for” a stadium project, but to provide our clients with the analysis and advice necessary to make their own informed decisions on whether the project can meet their goals. Where an alignment between those goals and the project needs are possible, we advise on how best to shape the project and manage its implementation to protect our clients’ interests. Where an alignment between our client’s goals and the project potential is not possible, we make that finding clear to our clients and, in such cases, they typically choose not to proceed with project implementation. We did state at the June 12 work session that our clients are most frequently the public sector partner to a stadium proposal (a city or county government, or other local or state governmental agency) rather than the professional sports team involved. We further stated that we have often advised that a proposed project cannot be shaped to meet our clients’ stated goals. The statistics are that, of the 85 B&D Venues professional stadium assignments cited above, less than half have been built. While there were often other contributing factors to the outcome, the remaining majority may be viewed as not having proceeded because of B&D Venues’ advice. With regard to the questions posed below, the conditions and outcomes of the 85 projects cited above have varied so widely that enumerating them in a way that provides a detailed and correct answer for each of the questions would be a prohibitively extensive exercise and would not yield summary findings that would be helpful to the City of Austin. We therefore provide very general summary responses below. We would be happy to provide direct responses related to any specific project, to the extent possible. Our responses below relate to work completed by B&D Venues in connection with projects (whether proposed or realized) for National Football League (NFL) and Major League Soccer (MLS) stadiums; Major League Baseball (MLB), Minor League Baseball (MiLB) and independent baseball league ballparks; National Hockey League (NHL) and National Basketball Association (NBA) arenas; and other minor league or independent league sports venues of various types. QUESTION: Please provide me with specifics of the deals B&D's clients struck, including land cost - was the land publicly owned? Does it continue to be public and if so, then for how long? What financial obstacles did the cities have to overcome to secure the stadium deal? RESPONSE: The terms of the “deals” for the completed projects noted above are too numerous and vary too greatly to summarize here. It is a fair generalization to say that most of these projects were built on public land and were built under a lease or other agreement that allowed land ownership to remain with the public, while used for the project’s stated purposes during the term of the lease. The financial obstacles faced by the cities usually involved finding sources of funds to meet the public capital investment components called for in the deal. QUESTION: What property tax revenues would have been paid or foregone by the stadium owners? What tax rates do these cities impose? What other subsidies have teams petitioned municipalities for since building their stadium? RESPONSE: As a broad generalization, professional sports venue agreements are typically structured to avoid the payment of property tax on the venue, through one legal provision or another. The tax policies and rates of the many different cities involved in the 85 projects cited above are too numerous and varied to summarize here. We are not aware of any circumstances in which professional sports teams connected with these projects have petitioned cities for subsidies subsequent to the completion of the sports venue project in question. QUESTION: How did the public perceive these deals? Please have B&D provide us with relevant news stories, pro and con. RESPONSE: A thorough response to this questions would require a prohibitively extensive research effort, as B&D Venues does not retain files of news stories related to our project work. QUESTION: What are B&D's professional take-aways for clients trying to decide a question of such import: Which cities won and which ones lost in their negotiations? What advice do B&D principals give to cities trying to decide this question? RESPONSE: We advise our clients to define clearly their goals for economic development and the quality of life of their stakeholders, and set the financial parameters governing what they are willing to invest to achieve those goals. We believe that the Austin City Council has, through its ordinances on this proposal, provided a clear set of directions to City staff identifying its requirements for the proposed project to meet the aforementioned goals. We further believe that City staff have aggressively negotiated a term sheet that meets those requirements in every way feasible. QUESTION: Please provide Council with a complete list of B&D Venues clients. QUESTION: Please clarify who is responsible for Stadium, site, and off-site municipal service expenses. QUESTIONS: The City and Council will require extensive financial and other information as part of the decision-making process - would either or both entities be good and faithful partners for the City of Austin and its residents to entrust significant levels of public assets to them for a considerable period of time? What does such a partnership look like and who benefits and who doesn't, and who stands to have to clean things up financially if they go awry? A personal financial statement for any owner with 10% interest or greater in the team. QUESTION: Please arrange an opportunity for me to review the PSV/MLS proforma financials. RESPONSE: These questions and requests for information have been submitted to Precourt Sports Ventures (PSV). PSV provided the following link as responsive information to this request: https://www.columbuscrewsc.com/club/staff. QUESTION: Has PSV lined up a location to play the 2019 and 2020 games? If so, where is it located? Where are the practice fields? RESPONSE: (From PSV) Many decisions related to bringing MLS to Austin rest on the City making their decision on McKalla place, including the location of temporary playing and practice facilities. There are several opportunities for temporary facilities but finalizing them are dependent on the City’s action. QUESTION: Has PSV submitted a revised proposal? What discussions have staff members had since June 28 with PSV or its reps? RESPONSE: The negotiation process following the June 28, 2018, City Council action (Item 130 on the June 28 City Council Meeting) required City staff to work from PSV’s initial proposal. Through negotiations with PSV following June 28, staff has drafted a proposal for Council’s consideration. QUESTION: What is the game plan for the next few weeks, leading up to presenting information to the Council in early August? RESPONSE: Staff has been working with PSV and relevant parties to respond to the Council’s resolutions. The City of Austin negotiation team was assembled following Council’s direction and staff’s work will continue until Council’s final direction is resolved. QUESTION: How does this dovetail with presenting the alternative options to Council at the same time? RESPONSE: Information received in response to Item 60 on the June 28 Council Meeting Agenda will be presented to Council prior to Aug 9, 2018. This information can also be viewed on the McKalla Place Web site: www.austintexas.gov/McKalla. As of July 29 the Economic Development Department has not received information via this process. QUESTION: What are the Army Corp of Engineers requirements and procedures to have site evaluated? Will the City will need to request a Pre-Application Meeting Request by submitting a form? RESPONSE: A wetlands biologist from the Watershed Protection Department has visited the site and determined there is not a regulated wetland on the property. The listing on the national registry remains from an old “desktop” survey of possible wetland locations using aerial photos and topographic maps and is not based on an on the ground survey. Such sites are common around the country, some actually are wetlands, but some are later determined not to be a wetland once evaluated based on local and federal guidelines during on site surveys. QUESTION: Provide an estimate of how much environmental remediation at McKalla would cost. RESPONSE: Staff's anticipation is that there will be no additional cost for remediation of 10414 McKalla Place. Given the history of the site, further remediation is considered to be a low risk. The site has been characterized by City environmental experts as a thoroughly remediated site in Austin and has received closure form the Texas Commission on Environmental Quality for residential / unrestricted land use. The vast majority of the site was excavated to bedrock, revealing a small amount of additional contaminants that were disposed of per protocol. The rest of the clean material was sifted, sorted and placed back on site. There are a few unexcavated areas beneath foundations that were constructed before the explosion occurred in 2003, but there is no expectation that contaminants would be found beneath them. It is typical for the City of Austin to take responsibility for remediation of longstanding environmental issues when transferring property for redevelopment. public transit, including fully funding a Metro Rail train station and associated infrastructure that meets Capital Metro specifications. As noted in a memorandum to City Council by the City of Austin Purchasing Officer on June 28, 2018, the opportunity to submit plans for 10414 McKalla Place is not a purchasing activity and/or a procurement event. The following is not a public notice to a competitive process nor will the process identified below be used to select a qualified respondent for a City purpose. The City of Austin will not award any contract based on any information received in response to the Resolution on June 28. Participation in the process by providing a plan for McKalla Place will not benefit or deter any individual or firm from seeking to participate in any future solicitation, if one were to occur. Because this is not a procurement event, there will be no analysis or evaluation of information the City receives. Any person or entity may submit information in response to the Resolution noted above. Information regarding the site, 10414 McKalla Place, is available through the City of Austin’s most recently distributed report – McKalla Place: Staff Response to Austin City Council Resolution 20180322-99. Individuals or entities interested in submitting a plan should submit the following information via email to edd@austintexas.gov. Attach information as a PDF file. Information received through August 3, 2018, will be distributed by the Economic Development Department to City Council via memorandum on August 9, 2018. Individuals and/or entities that submitted plans under resolution 20180628-060 will have an opportunity to present to the City Council at a Special Called Meeting at 3pm on August 7, 2018. The Special Called Meeting notice can be viewed at: http://www.austintexas.gov/edims/document.cfm?id=303028. The City of Austin Economic Development Department released the following report in response to Austin Council Resolution No. 20180322-099. EDD hosted 11 Information Sessions that resulted in approximately 323 community members in attendance. *Citywide promoted Information Sessions offered supervised children's activities, electronic survey access and Spanish interpreters. 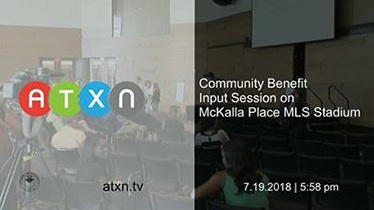 For the purpose of providing a Question and Answer (Q&A) resulting from City of Austin Informational Sessions, questions have been summarized and/or grouped in order to most efficiently address the questions received. City staff presented responses to summarized questions to most effectively provide available information. Please note that information will be evolving as information becomes available. QUESTIONS: What incentives is the city looking to offer to bring major league soccer (MLS) to Austin, Texas? Taxes? Subsidies? Free land? Why is the City of Austin giving the land for the soccer stadium rather than selling it to the developer? Will this property/company receive any subsidies or tax cuts like the Domain received? How much money will be needed? RESPONSE: Council Resolution No. 20180628-130 directed the City Manager to begin negotiations with PSV and to minimize costs to the City. The City provides incentives in exchange for community benefits. The City is conducting an additional community engagement forum in response to Resolution 20180628-130 to help determine what community benefits Austinites find important if a major league soccer team were to secure a partnership with the City. RESPONSE: This has not been determined due to the early stages of this overall initiative. In response to Resolution 20180628-130, the City is holding a community conversation to gather feedback as to what benefits of value should be prioritized regarding a potential future proposal of bringing an MLS team to Austin. QUESTIONS: What guarantees is the city asking from a potential private partner or entity to ensure adherence to a commitment to Austin? If this site falls through, what is the City’s plan? What is the calculated long term loss in monetary benefits if this falls through? How can the community prevent Precourt Sports Ventures from holding the city hostage for taxpayer funding when they want a stadium? Will the City of Austin maintain ownership of the property even if public funds are not used to build the stadium? RESPONSE: Council Resolution No. 20180628-130 directed the City Manager to begin negotiations with PSV and to minimize costs to the City. The City will negotiate contractual terms that ensure performance and provide mechanisms to address noncompliance of negotiated terms. QUESTIONS: Is the soccer stadium the best use of the land? Why doesn't the City of Austin issue a Request for Proposal (RFP) to request best use of the McKalla site? What are other potential uses for the site? (parks and open space, community center, housing) How much analysis has city staff done to date regarding affordable housing opportunity/feasibility of community benefits? How many other properties is the City looking at for affordable housing other than McKalla. In addition to McKalla Place, City of Austin staff is analyzing a number of publicly-owned parcels for community benefits as directed by Council. This analysis will put forward procurement recommendations as it relates to the redevelopment of City-owned vacant land. A Request for Proposal is one tool that could be utilized. QUESTIONS: How far along was the process to develop the site as affordable housing prior to being identified as a potential site for MLS? Why wasn’t the full intent of resolution shared? Why no mention of affordable housing which is also mentioned? If affordable housing is goal No. 1, why not just build affordable housing on the McKalla property? Has McKalla been considered for a park? How much analysis has city staff done to date regarding affordable housing opportunity/feasibility? RESPONSE: The process to develop McKalla Place as affordable housing has not been initiated. The City of Austin has not made a determination as to the community benefits for the particular site nor has there been a final determination as to the use of the site. McKalla Place is one of several tracts that the City of Austin is analyzing for potential community benefits. This analysis is currently underway and is in the early stages. QUESTIONS: How will surrounding businesses and residents be impacted regarding noise, lights, traffic, public safety, and code enforcement? How will utility services be improved? How will it impact sewer/power/water/phone/etc.? Are there plans to acquire easements or right-of-ways on Burnet and on Braker Lane so there can be vehicular access to the stadium/parking? RESPONSE: Council Resolution No. 20180628-130 directed the City Manager to begin negotiations with PSV and to minimize costs to the City. The City provides incentives in exchange for community benefits. The City is conducting an additional community engagement forum in response to Resolution 20180628-130 to help determine what community benefits Austinites find important if a major league soccer team were to secure a partnership with the City. City Council has directed staff to evaluate the impacts that a proposed soccer stadium could have on the surrounding properties and nearby neighborhoods, including light, sound, traffic, public safety, parking and economic impacts. Any development of the property will require a detailed traffic impact assessment at the Zoning or Site Plan Stage. QUESTION: How many businesses on McKalla Place face potential displacement (and employee face potential unemployment) because street would need to be widened? RESPONSE: The City has not determined any specific business or number of businesses that would be displaced should an agreement be approved for use of a soccer stadium. QUESTION: Have surrounding businesses been engaged in the discussion? RESPONSE: There are opportunities through public meetings for the area businesses to engage in the discussion. Should City Council direct staff to execute an agreement with a private entity for use of the site as a soccer stadium, additional engagement opportunities will continue for area residents and businesses. QUESTION: Is Austin Energy one of several City of Austin departments offering subject matter expertise on this issue? QUESTION: How will construction of the stadium affect potential for other high density development in the area? RESPONSE: The McKalla Place site under review is within the North Burnet Gateway Master Plan, but retains the original Limited Industrial Services zoning, that would allow for a stadium as a conditional use. The area around McKalla Place has zoning that would allow for high density development in appropriate locations within North Burnet Gateway. QUESTIONS: Would more investment by forthcoming for segments of the Red Line Urban Trail around the McKalla Place site to improve the multi-model connectivity to the site? Would there be connectivity from Metric via Delta Drive? (bike / pedestrian) How will traffic congestion be mitigated? McKalla Place is surrounded by a residential area. How are you going to mitigate the impact of traffic to the residence on already congested roads? How does the city plan to exit all the vehicles after a game onto Rutland? How are you going to manage traffic? What is the traffic management plan for 20,000 fans including parking? What sort of considerations are being made for traffic, which is already heavily increased in this area due to growth at the Domain? RESPONSE: Should an agreement be reached to construct a soccer stadium, the City would require a detailed traffic impact analysis that would assume the plans for the redevelopment of surrounding properties. QUESTION: Will the City take back the State Highway and if so, where? RESPONSE: In March, the Austin City Council took steps to make sure the 2016 Mobility Bond corridor investments are being spent wisely by establishing formal partnerships with the Texas Department of Transportation (TxDOT) for improvements on corridors that are owned wholly or in part by the State of Texas. During a City Council meeting on March 22, 2018, the City Council approved a resolution authorizing City staff to negotiate and execute Advanced Funding Agreements with TxDOT for Burnet Road (US 183 to MoPac). The Advanced Funding Agreements outline how 2016 Mobility Bond funds will be applied as well as define the partnership with the state to optimize mobility and safety outcomes for the community.